Tintin and the Secret of Literature is a fascinating look at the themes and patterns behind Hergé's Tintin. McCarthy takes a cue from Tintin himself, who spends much of his time tracking down illicit radio signals, entering crypts and decoding puzzles, and suggests that we too need to 'tune in' and decode if we want to properly understand Hergé's work. 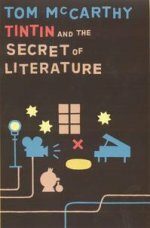 His startling conclusion is that Tintin's ultimate 'secret' may well be that of literature itself. Tom McCarthy is an artist and writer living in London. He will discuss his take on Hergé's world with Hans Ulrich Obrist, Co-Director of the Serpentine Gallery.